Lego street harassment: Construction worker Lego men shout "Hey babe!" on the job. The plastic claw hands are a creepy touch. This pervasive stereotype is insulting to women and contractors alike (as well as, you know, female contractors). Another gem of a sticker shows a frowning Lego construction worker announcing “JUST MY DAY JOB.” But the stereotype is pretty convenient for more culturally respected professional harassers. When we pin harassment on blue-collar workers, harassers who work in the comfort of their air-conditioned law offices (been harassed there) and government-contractor office parks (there, too) float by on the privilege of a suit and a high rung on the corporate ladder. 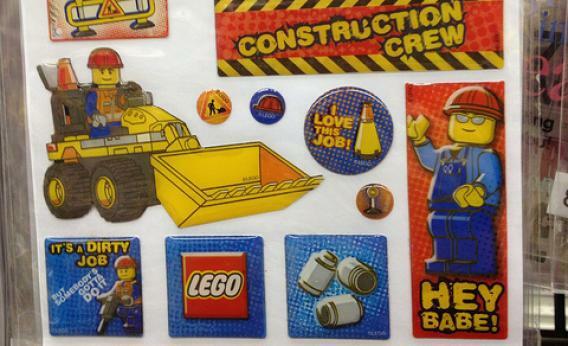 Meanwhile, toy developers at Lego are hollering at women through stickers for kids. That future rethinking of the “best possible LEGO experience” can’t come soon enough.